Who can forget the friend from another planet in Steven Spielberg’s 1982 mega hit ET, The Extraterrestrial? The kind, humble and brilliant alien from the film was a favorite among kids and the film is remembered even today for its emotional quotient. 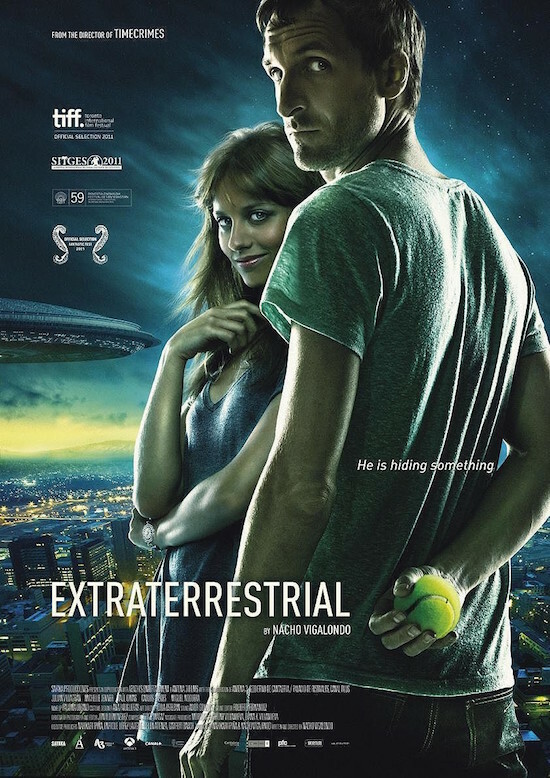 But in the the year 2014, we are going to witness another film titled EXTRATERRESTRIAL, but the aliens in this Sci-Fi Horror are going to scare the hell out of you because they are on earth not to make friends but to kill. Writer duo Vicious Brothers (known for another cult found footage Grave Encounters) have written the script of this film. The story is about a girl who invites her boyfriend to spend a romantic weekend at her parents’ cabin in the woods and where the boyfriend goes a step ahead and invites his friends for a party. When a UFO crashes nearby, the group encounters an alien from the ship. Scared from the outlandish creature, they kill him, only to be hunted by the other members of the ship. Director of the film is Colin Minihan (one of the Vicious brothers) an the lead cast includes Brittany Allen and Freddie Stroma .The film was premiered in the Tribeca Film Festival, receiving mixed reviews from the audience and praise from the critics. A trailer of the film was launched on YouTube a few days back and the film is looking forward to a wide release this year.